Organizing your child?s rooms or play space is a lot more important than you think. Your little one needs as much space to play and run around in as possible and you?ll be happy to learn there are many tricks of bending the space to achieve just that. 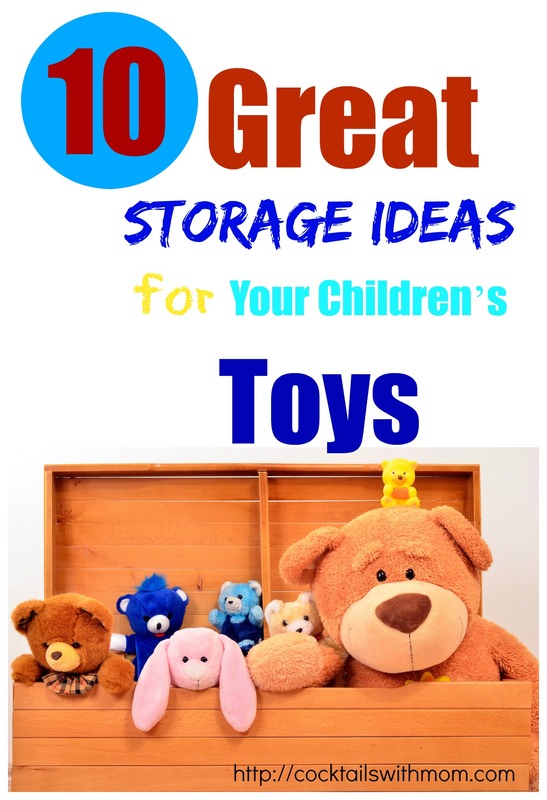 Here?s a list of ten storage ideas for their toys, which you can put into practice right now. #1. The stuffed toy hammock.? 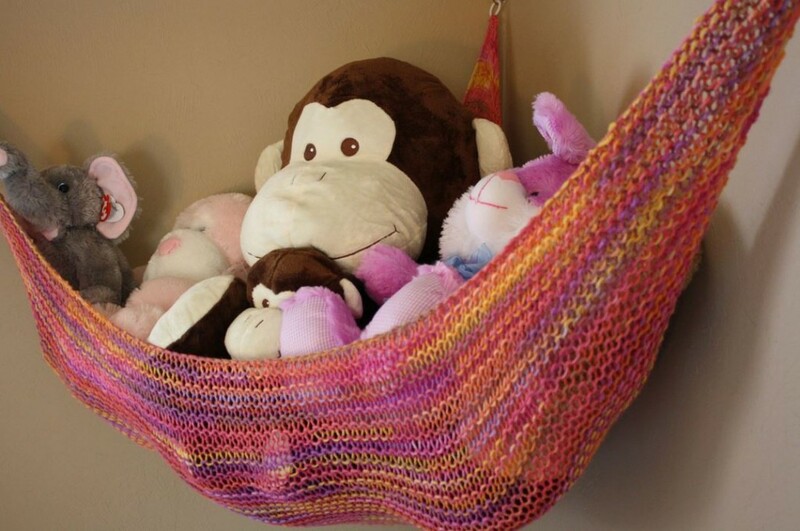 The toy hammock is a popular solution that?s inexpensive, easy to install, and a clever way to store stuffed toys keeping off the floor clearing up floor space. (most of the time, anyway, when they?re not being played with).? You can purchase one for less than $8 on Amazon , you can have a custom hammock made (like the one pictured above) on Etsy, or this would probably be a pretty easy DIY. In order to make a hammock for them, you simply need to nail a cute piece of fabric of your choice in a corner of your child?s room. Use the two walls coming together at a right angle to create a triangle space for your hammock. #2. Another great idea for stuffed toys is to simply hang a rope from a plant hanger on the ceiling and clip the colored animals on to it. You could also use a toy chain to pull this off.? This one will have to go in a corner of the room, in order to save even more space and, possibly, keep them out of sight. However, you should know that you will have to be ready to help your child reach them whenever he needs to, as some of them will be really high up. #3. Continuing in the lines of ?getting things out of the way and off the floor?, stuffed animals and not only can be kept in a metal garbage can. 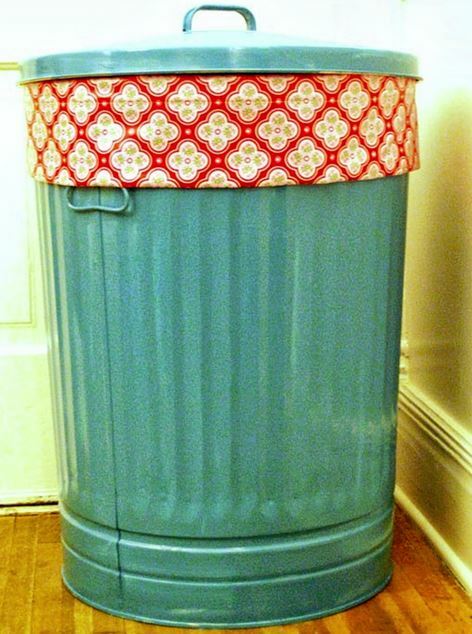 Yes, a real garbage can, like the ones you see on the curb. This will be a fun project for you and your kid, because you will have to repaint and decorate it, to make it colorful, playful and attractive for the munchkin. But it?s a very modern, creative and industrial storage choice. This one was created by Rebekah Merkle on her blog rebekahmerkle.blogspot.com, but I guess she is no longer blogging, and the link to her site doesn’t work. #4. Another great idea is to use the space under your child?s bed. For example, you can install a small lazy-susan under there and fit some storage boxes or containers. Your kid will revolve them in order to get to the item he needs. See how this one was made here.? It saves a lot of space, it?s hidden out of sight, and it will also solve the ?monster-under-the-bed? problem, because there?s simply no space left there for a monster.? Speaking of monsters under the bed. OH and? 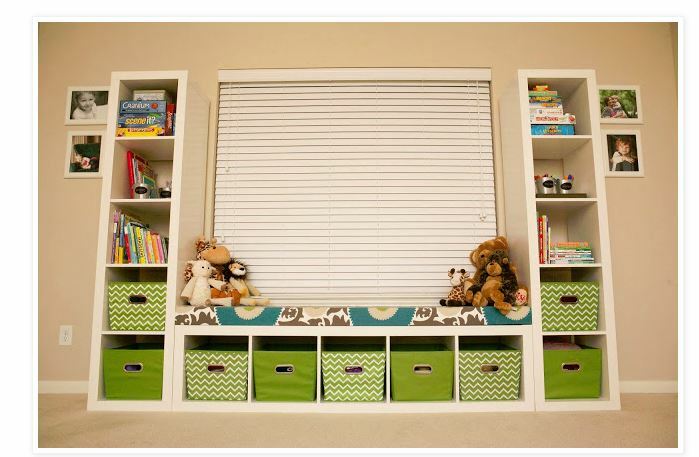 How adorable is this little Monster Under the Bed Storage Idea to keep things neat and tidy.? The green is my favorite but there are 3 different color options. , artistically placed somewhere in your daughter?s room. It will blend in perfectly with the decorum, even more so if you choose a classic, metallic design like this one . Shower caddies were meant for saving space in the first place, because bathrooms and showers were never spacious rooms. #6. For books your child uses all the time, like coloring books, comic books or bed-time stories heavily read day after day, we like this idea? from Fancy Frugal Life of using a plastic garbage bin. You can nail it to a wall, purchase one in a really bright color and transform it into a cool deposit place for books and magazines. Your little rascal will feel like he has his very own news stand or library where he can fancily take books from. Just remember to show him it?s very important to also put them back in the bin, otherwise there?s no point. #7. Need a place to hang your junior?s art other than the fridge? There?s a solution for that two. All you need is a string or a wire of any sort, which you nail all along a wall, from side to side. You will also need clips or maybe even clothes? pegs, in order to hang whatever your creative nipper has come up with lately. You can put up his drawings, letters that he?s written, pictures, clippings, posters, magazine articles and images, basically anything made of paper that should go on an art display. 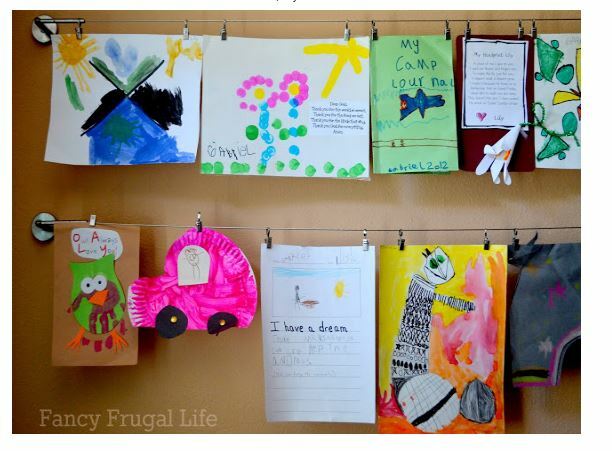 It?s very easy to do, extremely cheap and it will give your kid the sense he has his very own art corner, celebrated and loved. #8. Another amazing and definitely space saving idea is to buy a bookshelf, turn it on its side and use it as storage space. 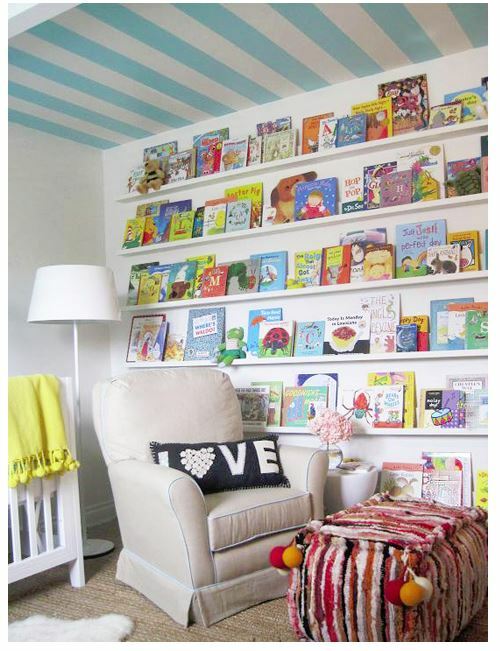 You can nail it to a wall, so it doesn?t present any danger to your child and add pillows on top of it. This way you also get a very nice and cozy sitting area, for playing, reading, coloring or even taking a nap. Fill the empty spaces beneath it, where the books would?ve normally went with plastic cases or plastic storage boxes. 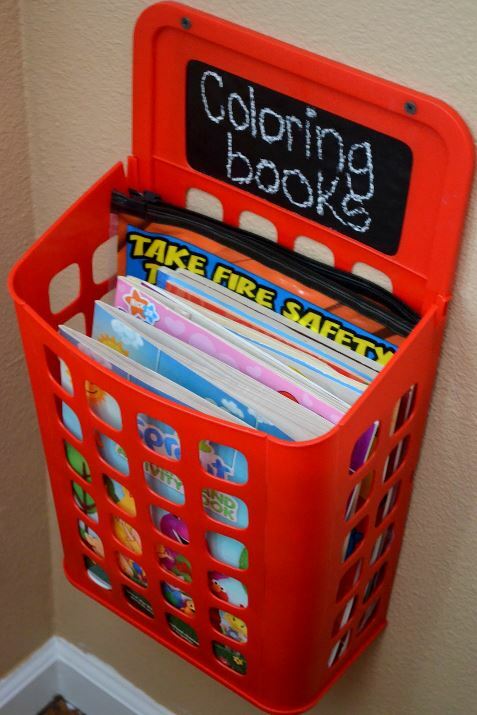 These will hold absolutely anything, from stuffed toys to books to metal cars. It is indeed one of very best and versatile ways of arranging your child?s bedroom, in a smart, cheap and space saving way. #9. Using the space underneath the table is also a means of getting things out of the way. A child?s room will, of course, always have a table for him to write, read, color and play at. So why not use the space below it? 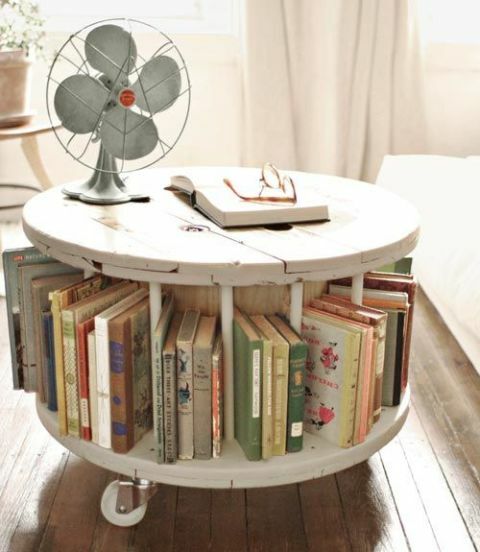 A nice round mobile table, for example, can be filled with books. It can also be moved around the room from place to place according to your wishes. So not only will you be able to get it out of the way when you want to, but you also now have a 2-in-1 table/bookshelf. #10. 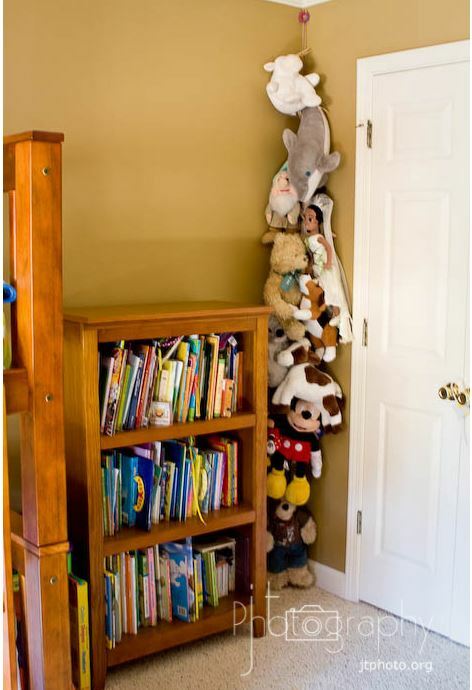 And, last but not least, although there are some great ways of storing toys and saving space out there, do not underestimate the power of shelves. They will always be your best friends when it comes to your child?s things. The more you build around your house, the better, because the kid?s going to have a lot of things and you know that. 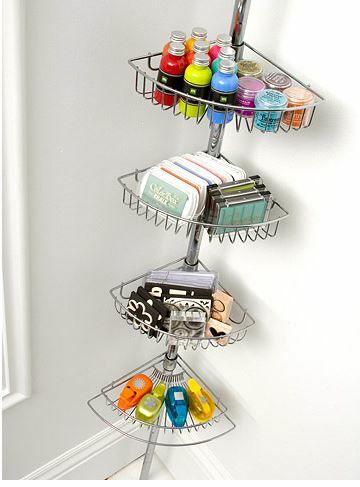 You will need to find a way to store them all and, no matter how creative you get, in the end, shelves and storage cases will become your partner for life. Find a way to do it artistically and you found the key to a happy and beautiful home. Interior Designer named Elizabeth Sullivan.com. Site temporarily unavailable but wanted to be sure she received the credit for this awesome design. Author bio: Martin Laird is a home economics teacher and a proud father of two girls, a naughty kindergartner who has a pet rock and a teenage girl who loves playing guitar. He loves to engage in fun DIY projects with them and go for ice-cream when they finish. « Mix it up with Stella & Chewy?s Meal Mixers!